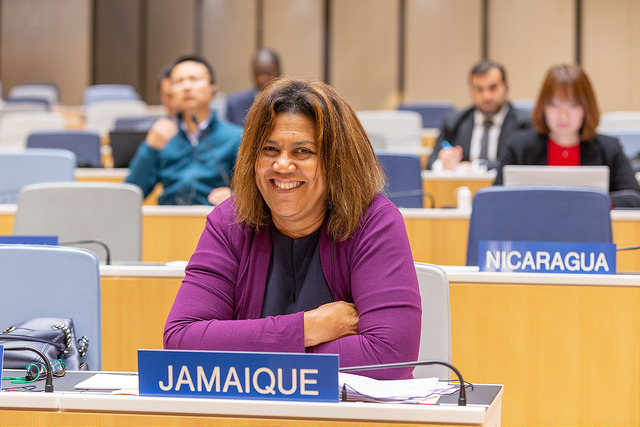 The 38th session of the Intergovernmental Committee on Intellectual Property and Genetic Resources, Traditional Knowledge and Folklore (IGC) is taking place from 10-14 December. The two facilitators of the drafting process, Paul Kuruk, vice-chairman, Ghana International Trade Commission (GITC), Ministry of Trade and Industry, and Lilyclaire Bellamy, executive director, Jamaica Intellectual Property Office (JIPO), on 12 December presented the first round of proposed changes (Rev1) they introduced in the draft articles. They introduced a proposed revision [pdf] of draft articles on the protection of traditional knowledge (TK), and a proposed revision [pdf] of draft articles on the protection of traditional cultural expressions (TCEs). Those documents, as underlined by IGC Chair Ian Goss, have no other status, and remain informal documents. Rev1 TK document with track changes is here [pdf], and Rev1 TCEs document with track changes is here [pdf]. Those proposed changes were expected to be discussed and commented on this afternoon, and the facilitators should issue a second revision of the texts, taking into account comments and suggestions made on the first revision. If changes in the second revision meet the agreement of the IGC, this revision is expected to be adopted to be transmitted to the next session of the IGC. In drafting the draft revised articles, the two facilitators took into account the results of discussions in two “contact groups,” gathering a small number of delegates from all WIPO regions, which met yesterday to work on specific issues: subject matter of the proposed instrument, and its scope of protection. Main changes in Article 5 (Scope of Protection) of the TK draft articles relate to a tiered approach in the protection of TK. This is not a new idea, but the concept has been slightly edited. Kuruk explained that the facilitators followed the suggestion by the contact group yesterday to define the three tiers as follows: traditional knowledge which is restricted, including sacred and secret knowledge; narrowly diffused knowledge,; and widely diffused knowledge, in alternative 2 of Article 5. Secret and sacred knowledge are no longer under a standalone category but are now included in the restricted TK tier. The second alternative of Article 5 also provides for each tier, “appropriate methods” of protection, maximum protection for restricted TK, and a minimum level of protection for widely diffused TK, according to Kuruk. A new paragraph d) of Article 5, alternative 2, provides for cases in which secret or sacred TK was acquired illegally, he added. A case of illegally acquired secret and sacred TK was illustrated in a side event yesterday about the sun symbol of the Zia Pueblo (IPW, WIPO, 11 December 2018). Bellamy introduced changes in Article 3 (Subject matter of the instrument). She said the definition of TK and TCEs have been aligned. However, she remarked that a list of eligibility criteria was still in the two sets of draft articles due to the lack of consensus on their removal. This article also contains a contentious time-related condition, introduced by the United States some IGC sessions ago, which states that the instrument would apply to TK that has been used for a term as has been determined by each member state, but not less than 50 years. The facilitators suggested to use “a reasonable” term to allow for flexibility at the national level instead of the 50 years. "WIPO: Facilitators Suggest First Revision Of Draft Articles On Protection Of TK, Folklore" by Intellectual Property Watch is licensed under a Creative Commons Attribution-NonCommercial-ShareAlike 4.0 International License.